It has been a slow process for me this year in decorating for Christmas. I am chairing a very large women's event at our church next week which will bring in nearly 600 women. My husband leans more towards Scrooge when it comes to the holidays so I thought I might let some of it go this year. Imagine my surprise this week when he asked me if I was going to "put up" Christmas this year? After 30 plus years of being together, maybe he does enjoy them after all! 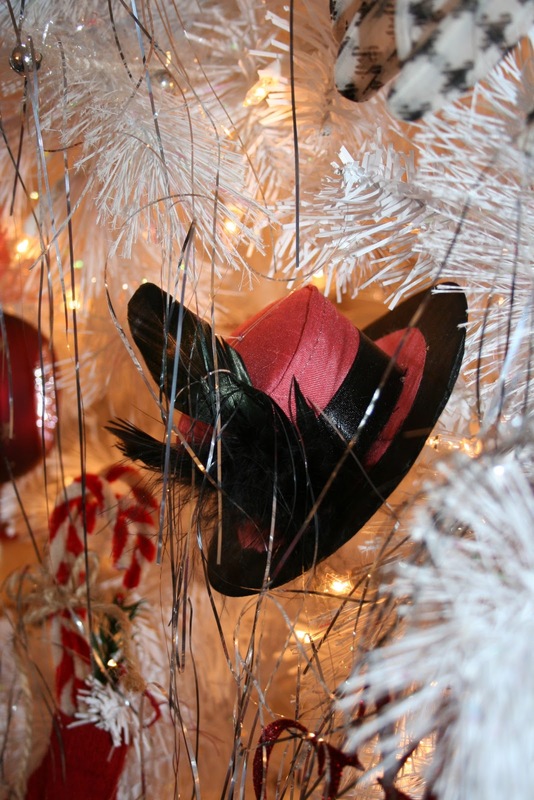 So I started in the dining room with my white tree decorated with red and black. There are tiny hats, vintage gloves, little dolls and much more. 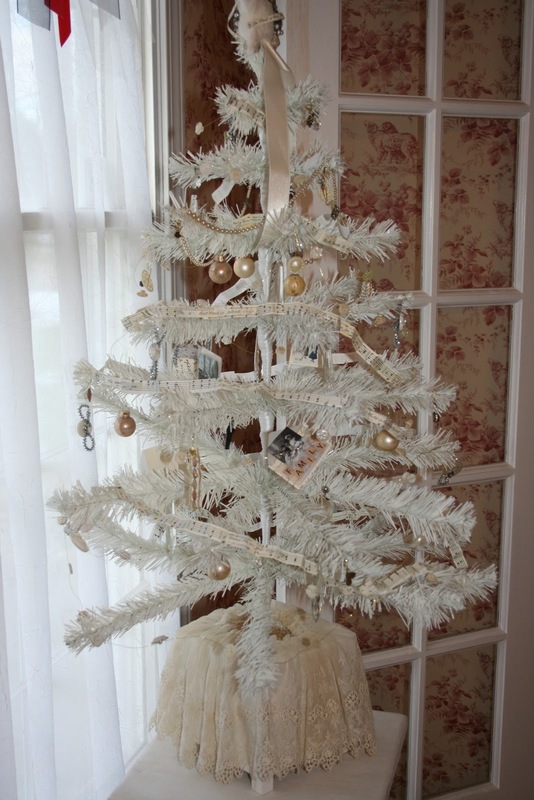 This year I added the silver icicles, just like we always had on our tree when I was growing up. 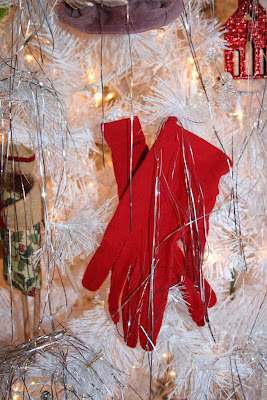 Without animals in the house now, or little children, I know it will stay on the tree! In front of one of the windows I have a little tree decorated with my grandmother's novelty jewelry and ornaments I made by hand. The trimming is a tiny garland made out of sheet music and a felted star. 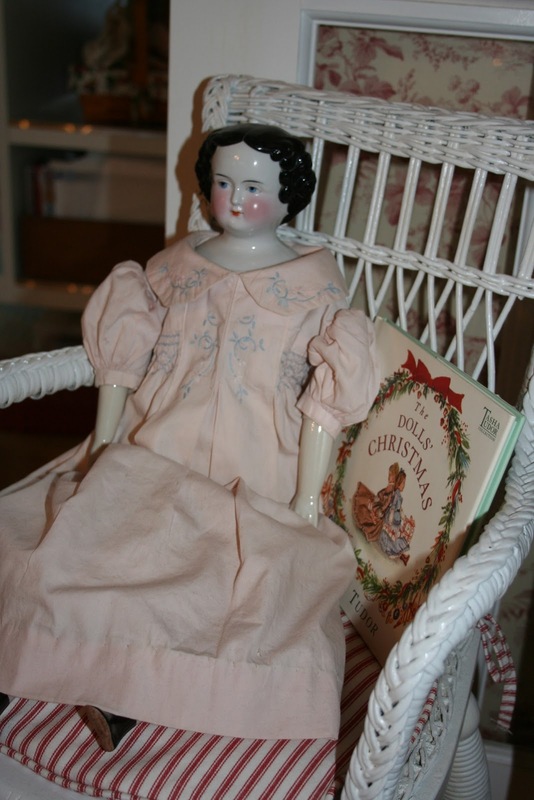 There is always my favorite doll with my favorite book from my childhood, "The Doll's Christmas". Next week I will take you on a tour of the other trees. Blessings today! Your trees are beautiful. I love the tiny little red gloves. Your china doll is a beauty. Lovely trees.I like the red and black idea.I adore porcelain dolls I have a collection of those.Love yours with the book. Oh, Renee! Christmas at your house is just beautiful! Love the wall paper in this room, too! your decorations and trees look really nice!! 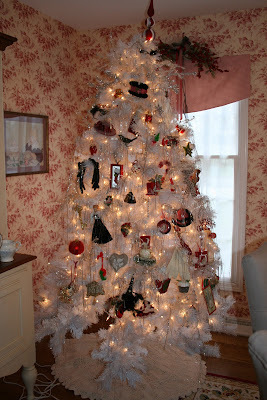 I like the tree with your mothers ornaments by the window- that looks really nice!! Thanks for posting pictures from around your house- I enjoyed looking at them!! I just love looking at other people's christmas trees!! Your look very pretty! 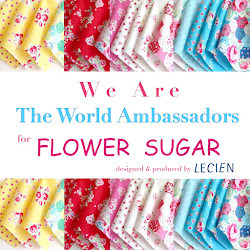 I am having a giveaway on my blog and would love to see you enter! Oh so homey and beautiful! Renee, How gentle and lovely your things are. It is so peaceful, such eye candy...thank you for sharing. I love your trees! Looking forward to seeing what else you do.